The online distribution channel occupied almost half of the global bluetooth market share, growing at a CAGR of more than 11% during 2017-2023. CHICAGO, IL, UNITED STATES, July 11, 2018 /EINPresswire.com/ -- Arizton’s recent market research report on the global Bluetooth speaker market provides detailed analysis of market segmentation by product (traditional speaker, waterproof speaker, and rugged speaker), by price range (low-end, mid-range, and premium), by end-user type (residential users and commercial users), by portability (fixed and portable),by distribution channel(online,retail) and by geography (APAC, Europe, North America, Latin America, and MEA). The development of the residential sector and rise in awareness about these devices in emerging countries in APAC and other regions will help players expand their businesses in these countries. The integration of latest Bluetooth technology, innovative waterproof and rugged models, and enhanced marketing and visibility of these products online will have a positive impact on the overall growth of the global market. The global Bluetooth speaker market is projected to generate revenues of more than $8 billion by 2023, growing at a CAGR of over 10% during 2018-2023. The report provides market share both in terms of revenue and unit shipment values. 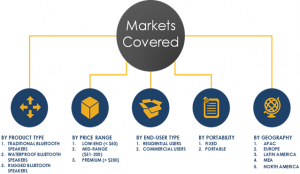 The global Bluetooth speaker market is divided into major segments that include by products, price range, end-users, portability, distribution channel and geography. The global bluetooth speaker market by geography is segmented into APAC, Europe, North America, Latin America, and MEA. APAC is the fastest growing region in the market, at a CAGR of around 10% during the forecast period. The increasing proliferation of low-end bluetooth speakers is one of the major contributing factors in the growth of the APAC region in the market. Countries such as Australia, China, South Korea, and Japan are the largest revenue generators in the APAC market. The improvement in the quality of life and increase in per capita income is attributing to the rising demand in the APAC bluetooth speaker market. Urbanization in China and India is shifting the consumer's preferences and boosting the demand for these wireless speakers in the APAC market. The availability of budgeted smartphones and decent Internet connections will help vendors launch new product models in the APAC market. The implementation of advanced and autonomous products and solutions in the home and office spaces will revolutionize the APAC market during the forecast period. North America led the market share in 2017, growing at CAGR of around 11% during the forecast period. The increasing adoption of connected homes and smart devices is one of the primary factors attributing to the growth of North America in this market. Bluetooth speaker market in US and Canada are the largest revenues generators in the North American market. The latest trend of on-demand streaming, rise in the number of smartphone users, and availability of high-speed internet connectivity are some of the factors helping in the development of the market in North America. Some of the leading music streaming applications popular in North America are Pandora, Shazam, Spotify, iHeartRadio, Slacker Radio, and Soundcloud. The presence of a larger digital generation is augmenting the growth of North America in the global Bluetooth speaker market. The product type segment in the global Bluetooth speaker market is classified into traditional speaker, waterproof speaker, and rugged speaker. The rugged speaker segment dominated a considerable market share in 2017, growing at a CAGR of over 14% during the forecast period. These speakers are designed with dust protection, weather resistance, and water-resistant properties. Bluetooth speakers with a rating of IP67, IP68, and IP69K usually fall under this category and is gaining immense popularity in the global market. The increasing popularity and worldwide demand for these products will boost sales in the global Bluetooth speaker market. Rugged models are shock-proof, dustproof, water-proof, and weather-resistant and are sold across developed countries across the market. These models are primarily designed for rough use and can function well in the outdoors perfectly. The primary end-users of the rugged speaker in the global market consists of mostly leisure travelers and solo travelers. The global Bluetooth speaker market by distribution channel is segmented into retail and online channels. The online channel occupied almost half of the market share in 2017, growing at a CAGR of more than 11% during the forecast period. The emergence of online OEMs’ e-commerce portals and online direct-to-consumer stores is attributing to the growth of this segment in the global market. Leading players such as Amazon, eBay, Best Buy, Alibaba, and JD.com are some of the largest revenues generators in the online store segment in the global Bluetooth speaker market. The vendors are promoting the concept and use of Bluetooth devices and technology by leveraging social media to reach a wide group of end-users in the global market. The ease-of-accessibility and convenience afforded by these online channels are augmenting the development of this segment in the global market. 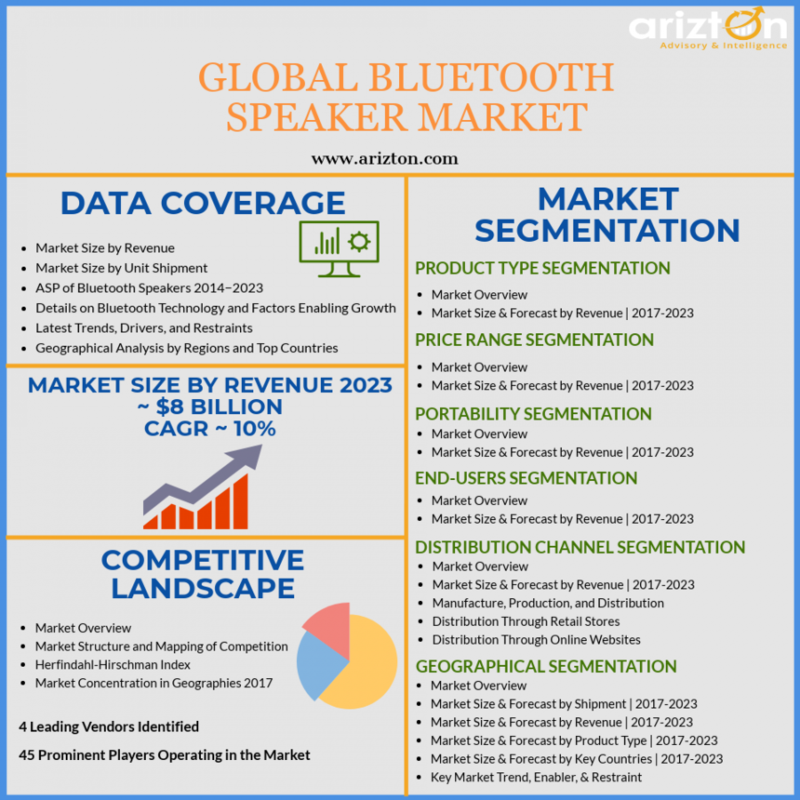 The complete overview of the latest market research report on global Bluetooth speaker market by Arizton is now available.